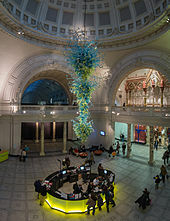 In 2000, an 11-metre high, blown glass chandelier by Dale Chihuly was installed as a focal point in the rotunda at the V&A's main entrance. The Victoria and Albert Museum (often abbreviated as the V&A) in London is the world's largest museum of applied and decorative arts and design, as well as sculpture, housing a permanent collection of over 2.27 million objects. It was founded in 1852 and named after Queen Victoria and Prince Albert. 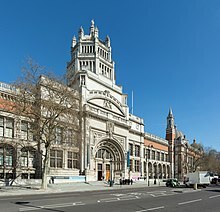 The V&A is located in the Brompton district of the Royal Borough of Kensington and Chelsea, in an area that has become known as "Albertopolis" because of its association with Prince Albert, the Albert Memorial and the major cultural institutions with which he was associated. These include the Natural History Museum, the Science Museum, the Royal Albert Hall and Imperial College London. The museum is a non-departmental public body sponsored by the Department for Culture, Media and Sport. As with other national British museums, entrance is free. The V&A covers 12.5 acres (5.1 ha) and 145 galleries. Its collection spans 5,000 years of art, from ancient times to the present day, from the cultures of Europe, North America, Asia and North Africa. However, the art of antiquity in most areas is not collected. The holdings of ceramics, glass, textiles, costumes, silver, ironwork, jewellery, furniture, medieval objects, sculpture, prints and printmaking, drawings and photographs are among the largest and most comprehensive in the world. The museum owns the world's largest collection of post-classical sculpture, with the holdings of Italian Renaissance items being the largest outside Italy. 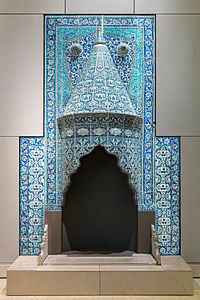 The departments of Asia include art from South Asia, China, Japan, Korea and the Islamic world. The East Asian collections are among the best in Europe, with particular strengths in ceramics and metalwork, while the Islamic collection is amongst the largest in the Western world. Overall, it is one of the largest museums in the world. Since 2001 the museum has embarked on a major £150m renovation programme. New 17th- and 18th-century European galleries were opened on 9 December 2015. These restored the original Aston Webb interiors and host the European collections 1600–1815. The V&A Museum of Childhood in East London is a branch of the museum, and a new branch in London is being planned. The Victoria and Albert Museum has its origins in the Great Exhibition of 1851, with which Henry Cole, the museum's first director, was involved in planning. Initially it was known as the Museum of Manufactures, first opening in May 1852 at Marlborough House, but by September had been transferred to Somerset House. At this stage the collections covered both applied art and science. Several of the exhibits from the Exhibition were purchased to form the nucleus of the collection. By February 1854 discussions were underway to transfer the museum to the current site and it was renamed South Kensington Museum. In 1855 the German architect Gottfried Semper, at the request of Cole, produced a design for the museum, but it was rejected by the Board of Trade as too expensive. The site was occupied by Brompton Park House; this was extended including the first refreshment rooms opened in 1857, the museum being the first in the world to provide such a facility. The official opening by Queen Victoria was on 20 June 1857. In the following year, late night openings were introduced, made possible by the use of gas lighting. This was to enable in the words of Cole "to ascertain practically what hours are most convenient to the working classes"—this was linked to the use of the collections of both applied art and science as educational resources to help boost productive industry. In these early years the practical use of the collection was very much emphasised as opposed to that of "High Art" at the National Gallery and scholarship at the British Museum. George Wallis (1811–1891), the first Keeper of Fine Art Collection, passionately promoted the idea of wide art education through the museum collections. This led to the transfer to the museum of the School of Design that had been founded in 1837 at Somerset House; after the transfer it was referred to as the Art School or Art Training School, later to become the Royal College of Art which finally achieved full independence in 1949. From the 1860s to the 1880s the scientific collections had been moved from the main museum site to various improvised galleries to the west of Exhibition Road. In 1893 the "Science Museum" had effectively come into existence when a separate director was appointed. The laying of the foundation stone of the Aston Webb building (to the left of the main entrance) on 17 May 1899 was the last official public appearance by Queen Victoria. It was during this ceremony that the change of name from the South Kensington Museum to the Victoria and Albert Museum was made public. Queen Victoria's address during the ceremony, as recorded in The London Gazette, ended: "I trust that it will remain for ages a Monument of discerning Liberality and a Source of Refinement and Progress." The opening ceremony for the Aston Webb building by King Edward VII and Queen Alexandra took place on 26 June 1909. In 1914 the construction commenced of the Science Museum, signalling the final split of the science and art collections. Since 2001 the museum has embarked on a major £150m renovation programme. 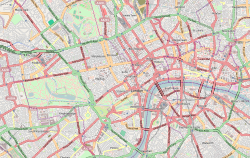 In 2001 "FuturePlan" was launched, which involves redesigning all the galleries and public facilities in the museum that have yet to be remodelled. This is to ensure that the exhibits are better displayed, more information is available and the museum meets modern expectations for museum facilities; it should take about ten years to complete the work. A new entrance, courtyard and gallery designed by Amanda Levete's AL A was scheduled for opening in 2017. In March 2018, it was announced that the Duchess of Cambridge would become the first royal patron of the museum. V&A Dundee under construction in April 2017. V&A Dundee opened on 15 September 2018. The V&A was in discussion with the University of Dundee, University of Abertay, Dundee City Council and the Scottish Government with a view to opening a new £43 million gallery in Dundee that would use the V&A brand although it would be funded through and operated independently. As of 2015, with costs estimated at £76 million, it is the most expensive gallery project  ever undertaken in Scotland. The V&A Dundee will be on the city's waterfront and is intended to focus on fashion, architecture, product design, graphic arts and photography. It is scheduled to open on 15 September 2018. Dundee City Council was expected to pay a major part of the running costs. The V&A was not contributing financially, but would be providing expertise, loans and exhibitions. The museum is a non-departmental public body sponsored by the Department for Culture, Media and Sport. As with other national British museums, entrance is free. Victorian parts of the building have a complex history, with piecemeal additions by different architects. Founded in May 1852, it was not until 1857 that the museum moved to its present site. This area of London was known as Brompton but had been renamed South Kensington. The land was occupied by Brompton Park House, which was extended, most notably by the "Brompton Boilers", which were starkly utilitarian iron galleries with a temporary look and were later dismantled and used to build the V&A Museum of Childhood. The first building to be erected that still forms part of the museum was the Sheepshanks Gallery in 1857 on the eastern side of the garden. Its architect was civil engineer Captain Francis Fowke, Royal Engineers, who was appointed by Cole. The next major expansions were designed by the same architect, the Turner and Vernon galleries built in 1858–59 to house the eponymous collections (later transferred to the Tate Gallery) and now used as the picture galleries and tapestry gallery respectively. The North and South Courts were then built, both of which opened by June 1862. They now form the galleries for temporary exhibitions and are directly behind the Sheepshanks Gallery. On the very northern edge of the site is situated the Secretariat Wing; also built in 1862, this houses the offices and board room etc. and is not open to the public. An ambitious scheme of decoration was developed for these new areas: a series of mosaic figures depicting famous European artists of the Medieval and Renaissance period. These have now been removed to other areas of the museum. Also started were a series of frescoes by Lord Leighton: Industrial Arts as Applied to War 1878–1880 and Industrial Arts Applied to Peace, which was started but never finished. To the east of this were additional galleries, the decoration of which was the work of another designer Owen Jones; these were the Oriental Courts (covering India, China and Japan), completed in 1863. None of this decoration survives. Part of these galleries became the new galleries covering the 19th century, opened in December 2006. The last work by Fowke was the design for the range of buildings on the north and west sides of the garden. This includes the refreshment rooms, reinstated as the Museum Café in 2006, with the silver gallery above (at the time the ceramics gallery); the top floor has a splendid lecture theatre, although this is seldom open to the general public. The ceramic staircase in the northwest corner of this range of buildings was designed by F. W. Moody and has architectural details of moulded and coloured pottery. All the work on the north range was designed and built in 1864–69. The style adopted for this part of the museum was Italian Renaissance; much use was made of terracotta, brick and mosaic. This north façade was intended as the main entrance to the museum, with its bronze doors, designed by James Gamble and Reuben Townroe, having six panels, depicting Humphry Davy (chemistry); Isaac Newton (astronomy); James Watt (mechanics); Bramante (architecture); Michelangelo (sculpture); and Titian (painting); The panels thus represent the range of the museum's collections. Godfrey Sykes also designed the terracotta embellishments and the mosaic in the pediment of the North Façade commemorating the Great Exhibition, the profits from which helped to fund the museum. This is flanked by terracotta statue groups by Percival Ball. This building replaced Brompton Park House, which could then be demolished to make way for the south range. The interiors of the three refreshment rooms were assigned to different designers. The Green Dining Room (1866–68) was the work of Philip Webb and William Morris, and displays Elizabethan influences. The lower part of the walls are panelled in wood with a band of paintings depicting fruit and the occasional figure, with moulded plaster foliage on the main part of the wall and a plaster frieze around the decorated ceiling and stained-glass windows by Edward Burne-Jones. The Centre Refreshment Room (1865–77) was designed in a Renaissance style by James Gamble. The walls and even the Ionic columns in this room are covered in decorative and moulded ceramic tile, the ceiling consists of elaborate designs on enamelled metal sheets and matching stained-glass windows, and the marble fireplace was designed and sculpted by Alfred Stevens and was removed from Dorchester House prior to that building's demolition in 1929. The Grill Room (1876–81) was designed by Sir Edward Poynter; the lower part of its walls consist of blue and white tiles with various figures and foliage enclosed by wood panelling, while above there are large tiled scenes with figures depicting the four seasons and the twelve months, painted by ladies from the Art School then based in the museum. The windows are also stained glass; there is an elaborate cast-iron grill still in place. With the death of Captain Francis Fowke of the Royal Engineers, the next architect to work at the museum was Colonel (later Major General) Henry Young Darracott Scott, also of the Royal Engineers. He designed to the north west of the garden the five-storey School for Naval Architects (also known as the science schools), now the Henry Cole Wing, in 1867–72. Scott's assistant J. W. Wild designed the impressive staircase that rises the full height of the building. Made from Cadeby stone, the steps are 7 feet (2.1 m) in length, while the balustrades and columns are Portland stone. It is now used to jointly house the prints and architectural drawings of the V&A (prints, drawings, paintings and photographs) and Royal Institute of British Architects (RIBA Drawings and Archives Collections), and the Sackler Centre for arts education, which opened in 2008. Continuing the style of the earlier buildings, various designers were responsible for the decoration. The terracotta embellishments were again the work of Godfrey Sykes, although sgraffito was used to decorate the east side of the building designed by F. W. Moody. A final embellishment was the wrought iron gates made as late as 1885 designed by Starkie Gardner. These lead to a passage through the building. Scott also designed the two Cast Courts (1870–73) to the southeast of the garden (the site of the "Brompton Boilers"); these vast spaces have ceilings 70 feet (21 m) in height to accommodate the plaster casts of parts of famous buildings, including Trajan's Column (in two separate pieces). The final part of the museum designed by Scott was the Art Library and what is now the sculpture gallery on the south side of the garden, built in 1877–83. The exterior mosaic panels in the parapet were designed by Reuben Townroe, who also designed the plaster work in the library. Sir John Taylor designed the book shelves and cases. This was the first part of the museum to have electric lighting. This completed the northern half of the site, creating a quadrangle with the garden at its centre, but left the museum without a proper façade. In 1890 the government launched a competition to design new buildings for the museum, with architect Alfred Waterhouse as one of the judges; this would give the museum a new imposing front entrance. The main façade, built from red brick and Portland stone, stretches 720 feet (220 m) along Cromwell Gardens and was designed by Aston Webb after winning a competition in 1891 to extend the museum. Construction took place between 1899 and 1909. Stylistically it is a strange hybrid: although much of the detail belongs to the Renaissance, there are medieval influences at work. The main entrance, consisting of a series of shallow arches supported by slender columns and niches with twin doors separated by pier, is Romanesque in form but Classical in detail. Likewise the tower above the main entrance has an open work crown surmounted by a statue of fame, a feature of late Gothic architecture and a feature common in Scotland, but the detail is Classical. The main windows to the galleries are also mullioned and transomed, again a Gothic feature; the top row of windows are interspersed with statues of many of the British artists whose work is displayed in the museum. Prince Albert appears within the main arch above the twin entrances, and Queen Victoria above the frame around the arches and entrance, sculpted by Alfred Drury. These façades surround four levels of galleries. Other areas designed by Webb include the Entrance Hall and Rotunda, the East and West Halls, the areas occupied by the shop and Asian Galleries, and the Costume Gallery. The interior makes much use of marble in the entrance hall and flanking staircases, although the galleries as originally designed were white with restrained classical detail and mouldings, very much in contrast to the elaborate decoration of the Victorian galleries, although much of this decoration was removed in the early 20th century. The Museum survived the Second World War with only minor bomb damage. The worst loss was the Victorian stained glass on the Ceramics Staircase, which was blown in when bombs fell nearby; pockmarks still visible on the façade of the museum were caused by fragments from the bombs. In the immediate post-war years there was little money available for other than essential repairs. The 1950s and early 1960s saw little in the way of building work; the first major work was the creation of new storage space for books in the Art Library in 1966 and 1967. This involved flooring over Aston Webb's main hall to form the book stacks, with a new medieval gallery on the ground floor (now the shop, opened in 2006). Then the lower ground-floor galleries in the south-west part of the museum were redesigned, opening in 1978 to form the new galleries covering Continental art 1600–1800 (late Renaissance, Baroque through Rococo and neo-Classical). In 1974 the museum had acquired what is now the Henry Cole wing from the Royal College of Science. To adapt the building as galleries, all the Victorian interiors except for the staircase were recast during the remodelling. To link this to the rest of the museum, a new entrance building was constructed on the site of the former boiler house, the intended site of the Spiral, between 1978 and 1982. This building is of concrete and very functional, the only embellishment being the iron gates by Christopher Hay and Douglas Coyne of the Royal College of Art. These are set in the columned screen wall designed by Aston Webb that forms the façade. A few galleries were redesigned in the 1990s including the Indian, Japanese, Chinese, ironwork, the main glass galleries, and the main silverware gallery, which was further enhanced in 2002 when some of the Victorian decoration was recreated. This included two of the ten columns having their ceramic decoration replaced and the elaborate painted designs restored on the ceiling. As part of the 2006 renovation the mosaic floors in the sculpture gallery were restored—most of the Victorian floors were covered in linoleum after the Second World War. After the success of the British Galleries, opened in 2001, it was decided to embark on a major redesign of all the galleries in the museum; this is known as "FuturePlan", and was created in consultation with the exhibition designers and masterplanners Metaphor. The plan is expected to take about ten years and was started in 2002. To date several galleries have been redesigned, notably, in 2002: the main Silver Gallery, Contemporary; in 2003: Photography, the main entrance, The Painting Galleries; in 2004: the tunnel to the subway leading to South Kensington tube station, new signage throughout the museum, architecture, V&A and RIBA reading rooms and stores, metalware, Members' Room, contemporary glass, and the Gilbert Bayes sculpture gallery; in 2005: portrait miniatures, prints and drawings, displays in Room 117, the garden, sacred silver and stained glass; in 2006: Central Hall Shop, Islamic Middle East, the new café, and sculpture galleries. Several designers and architects have been involved in this work. Eva Jiřičná designed the enhancements to the main entrance and rotunda, the new shop, the tunnel and the sculpture galleries. Gareth Hoskins was responsible for contemporary and architecture, Softroom, Islamic Middle East and the Members' Room, McInnes Usher McKnight Architects (MUMA) were responsible for the new Cafe and designed the new Medieval and Renaissance galleries which opened in 2009. In September 2004, the museum's board of trustees voted to abandon a proposed extension, designed by Daniel Libeskind with Cecil Balmond, after failing to receive funding from the Heritage Lottery Fund. The central garden was redesigned by Kim Wilkie and opened as the John Madejski Garden on 5 July 2005. The design is a subtle blend of the traditional and modern: the layout is formal; there is an elliptical water feature lined in stone with steps around the edge which may be drained to use the area for receptions, gatherings or exhibition purposes. This is in front of the bronze doors leading to the refreshment rooms. A central path flanked by lawns leads to the sculpture gallery. The north, east and west sides have herbaceous borders along the museum walls with paths in front which continues along the south façade. In the two corners by the north façade there is planted an American Sweetgum tree. The southern, eastern and western edges of the lawns have glass planters which contain orange and lemon trees in summer, which are replaced by bay trees in winter. At night both the planters and water feature may be illuminated, and the surrounding façades lit to reveal details normally in shadow. Especially noticeable are the mosaics in the loggia of the north façade. In summer a café is set up in the south west corner. The garden is also used for temporary exhibits of sculpture; for example, a sculpture by Jeff Koons was shown in 2006. It has also played host to the museum's annual contemporary design showcase, the V&A Village Fete, since 2005. The collecting areas of the museum are not easy to summarize, having evolved partly through attempts to avoid too much overlap with other national museums in London. Generally, the classical world of the West and the Ancient Near East is left to the British Museum, and Western paintings to the National Gallery, though there are all sorts of exceptions, for example painted portrait miniatures, where the V&A has the main national collection. The Victoria & Albert Museum is split into four Collections departments: 1) Asia; 2) Furniture, Textiles and Fashion; 3) Sculpture, Metalwork, Ceramics & Glass; and, 4) Word & Image. The museum curators care for the objects in the collection and provide access to objects that are not currently on display to the public and scholars. The collection departments are further divided into sixteen display areas, whose combined collection numbers over 6.5 million objects, not all items are displayed or stored at the V&A. There is a repository at Blythe House, West Kensington, as well as annexe institutions managed by the V&A, also the Museum lends exhibits to other institutions. The following lists each of the collections on display and the number of objects within the collection. The V&A's collection of Art from Asia numbers more than 160,000 objects, one of the largest in existence. It has one of the world's most comprehensive and important collections of Chinese art whilst the collection of South Asian Art is the most important in the West. The museums coverage includes items from South and South East Asia, Himalayan Kingdoms, China, the Far East and the Islamic world. The Far Eastern collections include more than 70,000 works of art from the countries of East Asia: China, Japan and Korea. The T. T. Tsui Gallery of Chinese art opened in 1991, displaying a representative collection of the V&As approximately 16,000 objects from China, dating from the 4th millennium BC to the present day. Though the majority of art works on display date from the Ming and Qing dynasties, there are exquisite examples of objects dating from the Tang dynasty and earlier periods. Notably, a metre-high bronze head of the Buddha dated to c. 750 AD and one of the oldest items a 2,000-year-old jade horse head from a burial, other sculptures include life-size tomb guardians. Classic examples of Chinese manufacturing are displayed that include lacquer, silk, porcelain, jade and cloisonné enamel. Two large ancestor portraits of a husband and wife painted in watercolour on silk date from the 18th century. There is a unique Chinese lacquerware table, made in the imperial workshops during the reign of the Xuande Emperor in the Ming dynasty. Examples of clothing are also displayed. One of the largest objects is a bed from the mid-17th century. The work of contemporary Chinese designers is also displayed. The Toshiba gallery of Japanese art opened in December 1986. The majority of exhibits date from 1550 to 1900, but one of the oldest pieces displayed is the 13th-century sculpture of Amida Nyorai. Examples of classic Japanese armour from the mid-19th century, steel sword blades (Katana), Inrō, lacquerware including the Mazarin Chest dated c1640 is one of the finest surviving pieces from Kyoto, porcelain including Imari, Netsuke, woodblock prints including the work of Andō Hiroshige, graphic works include printed books, as well as a few paintings, scrolls and screens, textiles and dress including kimonos are some of the objects on display. One of the finest objects displayed is Suzuki Chokichi's bronze incense burner (koro) dated 1875, standing at over 2.25 metres high and 1.25 metres in diameter it is also one of the largest examples made. The museum also holds some cloisonné pieces from the Japanese art production company, Ando Cloisonné. The museum houses the National Art Library, a public library containing over 750,000 books, photographs, drawings, paintings, and prints. It is one of the world's largest libraries dedicated to the study of fine and decorative arts. The library covers all areas and periods of the museum's collections with special collections covering illuminated manuscripts, rare books and artists' letters and archives. The National Art Library (also called Word and Image Department) at the Victoria and Albert Museum collection catalogue used to be kept in different formats including printed exhibit catalogues, and card catalogues. A computer system called MODES cataloguing system was used from the 1980s to the 1990s, but those electronic files were not available to the library users. All of the archival material at the National Art Library is using Encoded Archival Description (EAD). The Victoria and Albert Museum has a computer system but most of the items in the collection, unless those were newly accessioned into the collection, probably do not show up in the computer system. There is a feature on the Victoria and Albert Museum web-site called "Search the Collections," but not everything is listed there. The Victoria and Albert Museum's Word and Image Department was under the same pressure being felt in archives around the world, to digitise their collection. A large scale digitisation project began in 2007 in that department. That project was entitled the Factory Project to reference Andy Warhol and to create a factory to completely digitise the collection. The first step of the Factory Project was to take photographs using digital cameras. The Word and Image Department had a collection of old photos but they were in black and white and in variant conditions, so new photos were shot. Those new photographs will be accessible to researchers to the Victoria and Albert Museum web-site. 15,000 images were taken during the first year of the Factory Project, including drawings, watercolors, computer-generated art, photographs, posters, and woodcuts. The second step of the Factory Project is to catalogue everything. The third step of the Factory Project is to audit the collection. All of those items which were photographed and catalogued, must be audited to make sure everything listed as being in the collection was physically found during the creation of the Factory Project. The fourth goal of the Factory Project is conservation, which means performing some basic preventable procedures to those items in the department. There is a "Search the Collections" feature on the Victoria and Albert web-site. The main impetus behind the large-scale digitisation project called the Factory Project was to list more items in the collections in those computer databases. The galleries also link design to wider trends in British culture. For instance, design in the Tudor period was influenced by the spread of printed books and the work of European artists and craftsmen employed in Britain. In the Stuart period, increasing trade, especially with Asia, enabled wider access to luxuries like carpets, lacquered furniture, silks and porcelain. In the Georgian age there was increasing emphasis on entertainment and leisure. For example, the increase in tea drinking led to the production of tea paraphernalia such as china and caddies. European styles seen on the Grand Tour also influenced taste. As the Industrial Revolution took hold, the growth of mass production produced entrepreneurs such as Josiah Wedgwood, Matthew Boulton and Eleanor Coade. In the Victorian era new technology and machinery had a significant effect on manufacturing, and for the first time since the reformation, the Anglican and Roman Catholic Churches had a major effect on art and design such as the Gothic Revival. There is a large display on the Great Exhibition which, among other things, led to the founding of the V&A. In the later 19th century, the increasing backlash against industrialisation, led by John Ruskin, contributed to the Arts and Crafts movement. One of the most dramatic parts of the museum is the Cast Courts in the sculpture wing, comprising two large, skylighted rooms two storeys high housing hundreds of plaster casts of sculptures, friezes and tombs. One of these is dominated by a full-scale replica of Trajan's Column, cut in half to fit under the ceiling. The other includes reproductions of various works of Italian Renaissance sculpture and architecture, including a full-size replica of Michelangelo's David. Replicas of two earlier Davids by Donatello and Verrocchio, are also included, although for conservation reasons the Verrocchio replica is displayed in a glass case. The two courts are divided by corridors on both storeys, and the partitions that used to line the upper corridor (the Gilbert Bayes sculpture gallery) were removed in 2004 to allow the courts to be viewed from above. Part of the reserve collection of European ceramics, on display on the top floor. 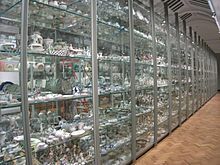 This is the largest and most comprehensive ceramics and glass collection in the world, with over 80,000 objects from around the world. Every populated continent is represented. Apart from the many pieces in the Primary Galleries on the ground floor, much of the top floor is devoted to galleries of ceramics of all periods covered, which include display cases with a representative selection, but also massed "visible storage" displays of the reserve collection. 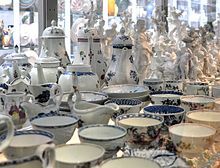 Well represented in the collection is Meissen porcelain, from the first factory in Europe to discover the Chinese method of making porcelain. Among the finest examples are the Meissen Vulture from 1731 and the Möllendorff Dinner Service, designed in 1762 by Frederick II the Great. Ceramics from the Manufacture nationale de Sèvres are extensive, especially from the 18th and 19th centuries. The collection of 18th-century British porcelain is the largest and finest in the world. Examples from every factory are represented, the collections of Chelsea porcelain and Worcester porcelain being especially fine. All the major 19th-century British factories are also represented. A major boost to the collections was the Salting Bequest made in 1909, which enriched the museum's stock of Chinese and Japanese ceramics. This bequest forms part of the finest collection of East Asian pottery and porcelain in the world, including Kakiemon ware. Another view of the "visible storage"
Prints and drawings from the over 750,000 items in the collection can be seen on request at the print room, the "Prints and Drawings study Room"; booking an appointment is necessary. The collection of drawings includes over 10,000 British and 2,000 old master works, including works by: Dürer, Giovanni Benedetto Castiglione, Bernardo Buontalenti, Rembrandt, Antonio Verrio, Paul Sandby, John Russell, Angelica Kauffman, John Flaxman, Hugh Douglas Hamilton, Thomas Rowlandson, William Kilburn, Thomas Girtin, Jean-Auguste-Dominique Ingres, David Wilkie, John Martin, Samuel Palmer, Sir Edwin Henry Landseer, Lord Frederic Leighton, Sir Samuel Luke Fildes and Aubrey Beardsley. Modern British artists represented in the collection include: Paul Nash, Percy Wyndham Lewis, Eric Gill, Stanley Spencer, John Piper, Robert Priseman, Graham Sutherland, Lucian Freud and David Hockney. The print collection has more than 500,000 items, covering: posters, greetings cards, book plates, as well as a comprehensive collection of old master prints from the Renaissance to the present, including works by Rembrandt, William Hogarth, Giovanni Battista Piranesi, Canaletto, Karl Friedrich Schinkel, Henri Matisse and Sir William Nicholson. In 1999, V&A began a series of live catwalk events at the museum titled Fashion in Motion featuring items from historically significant fashion collections. The first show featured Alexander McQueen in June 1999. Since then, the museum has hosted recreations of various designer shows every year including Anna Sui, Tristan Webber, Elspeth Gibson, Chunghie Lee, Jean Paul Gaultier, Missoni, Gianfranco Ferré, Christian Lacroix, Kenzo and Kansai Yamamoto amongst others. The Furniture and Woodwork collection also includes complete rooms, musical instruments, and clocks. Among the rooms owned by the Museum are the Boudoir of Madame de Sévilly (Paris, 1781–82) by Claude Nicolas Ledoux, with painted panelling by Jean Simeon Rousseau de la Rottière; and Frank Lloyd Wright's Kaufmann Office, designed and constructed between 1934 and 1937 for the owner of a Pittsburgh department store. The Soulages collection of Italian and French Renaissance objects was acquired between 1859 and 1865, and includes several cassone. The John Jones Collection of French 18th-century art and furnishings was left to the museum in 1882, then valued at £250,000. One of the most important pieces in this collection is a marquetry commode by the ébéniste Jean Henri Riesener dated c1780. Other signed pieces of furniture in the collection include a bureau by Jean-François Oeben, a pair of pedestals with inlaid brass work by André Charles Boulle, a commode by Bernard Vanrisamburgh and a work-table by Martin Carlin. Other 18th-century ébénistes represented in the Museum collection include Adam Weisweiler, David Roentgen, Gilles Joubert and Pierre Langlois. In 1901, Sir George Donaldson donated several pieces of art Nouveau furniture to the museum, which he had acquired the previous year at the Paris Exposition Universelle. This was criticised at the time, with the result that the museum ceased to collect contemporary items and did not do so again until the 1960s. In 1986 the Lady Abingdon collection of French Empire furniture was bequeathed by Mrs T. R. P. Hole. One of the oldest clocks in the collection is an astronomical clock of 1588 by Francis Nowe. One of the largest is James Markwick the younger's longcase clock of 1725, nearly 3 metres in height and japanned. Other clock makers with work in the collection include: Thomas Tompion, Benjamin Lewis Vulliamy, John Ellicott and William Carpenter. The jewellery collection, containing over 6000 items is one of the finest and most comprehensive collections of jewellery in the world and includes works dating from Ancient Egypt to the present day, as well as jewellery designs on paper. The museum owns pieces by renowned jewellers Cartier, Jean Schlumberger, Peter Carl Fabergé, Andrew Grima, Hemmerle and Lalique. Other items in the collection include diamond dress ornaments made for Catherine the Great, bracelet clasps once belonging to Marie Antoinette, and the Beauharnais emerald necklace presented by Napoleon to his adopted daughter Hortense de Beauharnais in 1806. The museum also collects international modern jewellery by designers such as Gijs Bakker, Onno Boekhoudt, Peter Chang, Gerda Flockinger, Lucy Sarneel, Dorothea Prühl and Wendy Ramshaw, and African and Asian traditional jewellery. Major bequests include Reverend Chauncy Hare Townshend's collection of 154 gems bequeathed in 1869, Lady Cory's 1951 gift of major diamond jewellery from the 18th and 19th centuries, and jewellery scholar Dame Joan Evans' 1977 gift of more than 800 jewels dating from the Middle Ages to the early 19th century. A new jewellery gallery, funded by William and Judith Bollinger, opened on 24 May 2008. This collection of more than 45,000 items covers decorative ironwork, both wrought and cast, bronze, silverware, arms and armour, pewter, brassware and enamels (including many examples Limoges enamel). The main iron work gallery was redesigned in 1995. Miniaturists represented in the collection include Jean Bourdichon, Hans Holbein the Younger, Nicholas Hilliard, Isaac Oliver, Peter Oliver, Jean Petitot, Alexander Cooper, Samuel Cooper, Thomas Flatman, Rosalba Carriera, Christian Friedrich Zincke, George Engleheart, John Smart, Richard Cosway and William Charles Ross. One of the more unusual collections is that of Eadweard Muybridge's photographs of Animal Locomotion of 1887, this consists of 781 plates. These sequences of photographs taken a fraction of a second apart capture images of different animals and humans performing various actions. There are several of John Thomson's 1876-7 images of Street Life in London in the collection. The museum also holds James Lafayette's society portraits, a collection of more than 600 photographs dating from the late 19th to early 20th centuries and portraying a wide range of society figures of the period, including bishops, generals, society ladies, Indian maharajas, Ethiopian rulers and other foreign leaders, actresses, people posing in their motor cars and a sequence of photographs recording the guests at the famous fancy-dress ball held at Devonshire House in 1897 to celebrate Queen Victoria's diamond jubilee. The collection of Italian, Medieval, Renaissance, Baroque and Neoclassical sculpture (both original and in cast form) is unequalled outside of Italy. It includes Canova's The Three Graces, which the museum jointly owns with National Galleries of Scotland. Italian sculptors whose work is held by the museum include: Bartolomeo Bon, Bartolomeo Bellano, Luca della Robbia, Giovanni Pisano, Donatello, Agostino di Duccio, Andrea Riccio, Antonio Rossellino, Andrea del Verrocchio, Antonio Lombardo, Pier Jacopo Alari Bonacolsi, Andrea della Robbia, Michelozzo di Bartolomeo, Michelangelo (represented by a freehand wax model and casts of his most famous sculptures), Jacopo Sansovino, Alessandro Algardi, Antonio Calcagni, Benvenuto Cellini (Medusa's head dated c. 1547), Agostino Busti, Bartolomeo Ammannati, Giacomo della Porta, Giambologna (Samson Slaying a Philistine c. 1562, his finest work outside Italy), Bernini (Neptune and Triton c. 1622–3), Giovanni Battista Foggini, Vincenzo Foggini (Samson and the Philistines), Massimiliano Soldani Benzi, Antonio Corradini, Andrea Brustolon, Giovanni Battista Piranesi, Innocenzo Spinazzi, Canova, Carlo Marochetti and Raffaelle Monti. An unusual sculpture is the ancient Roman statue of Narcissus restored by Valerio Cioli c1564 with plaster. There are several small scale bronzes by Donatello, Alessandro Vittoria, Tiziano Aspetti and Francesco Fanelli in the collection. The largest item from Italy is the Chancel Chapel from Santa Chiara Florence dated 1493–1500, designed by Giuliano da Sangallo it is 11.1 metres in height by 5.4 metres square, it includes a grand sculpted tabernacle by Antonio Rossellino and coloured terracotta decoration. There are also several Renaissance works by Northern European sculptors in the collection including work by: Veit Stoss, Tilman Riemenschneider, Hendrick de Keyser, Jan van Schayck, Hans Daucher and Peter Flötner. Baroque works from the same area include the work of, Adriaen de Vries and Sébastien Slodtz. The Spanish sculptors with work in the collection include Alonso Berruguete and Luisa Roldán represented by her Virgin and Child with St Diego of Alcala c. 1695. One of the largest objects in the collection is the 's-Hertogenbosch rood loft, from the Netherlands, dated 1610–13 this is as much a work of architecture as sculpture, 10.4 metres wide, 7.8 metres high, the architectural framework is of various coloured marbles including columns, arches and balustrade, against which are statues and bas-reliefs and other carvings in alabaster, the work of sculptor Conrad van Norenberch. The V&A holds the national collection of performing arts in the UK, including drama, dance, opera, circus, puppetry, comedy, musical theatre, costume, set design, pantomime, popular music and other forms of live entertainment. The Theatre & Performance collections were founded in the 1920s when private collector, Gabrielle Enthoven, donated her collection of theatrical memorabilia to the V&A. In 1974 two further independent collections were compiled to form a comprehensive performing arts collection at the V&A. The collections were displayed at the Theatre Museum, which operated from Covent Garden until closing in 2007. Theatre & Performance galleries opened at South Kensington in March 2009 tracing the production process of performance and include a temporary exhibition space. Types of items displayed include costumes, set models, wigs, prompt books, and posters. The department holds significant archives documenting current practice and the history of performing arts. These include the English Stage Company at the Royal Court Theatre, D'Oyly Carte and the design collection of the Arts Council. Notable personal archives include Vivien Leigh, Peter Brook, Henry Irving and Ivor Novello. Rock and pop are well represented with the Glastonbury Festival archive, Harry Hammond photographic collection and Jamie Reid archive documenting punk. Costumes include those worn by John Lennon, Mick Jagger, Elton John, Adam Ant, Chris Martin, Iggy Pop, Prince, Shirley Bassey and the stage outfit worn by Roger Daltrey at Woodstock. The V&A came second in London's top paid exhibitions in 2015 with the record-breaking Alexander McQueen show (3,472 a day). ^ "2017 Visitor Figures". Association of Leading Visitor Attractions. Retrieved 22 March 2018. ^ Stewart, Heather (13 January 2017). "Tristram Hunt to quit as MP to become V&A director". The Guardian. ISSN 0261-3077. Retrieved 13 January 2017. ^ "V&A · About us". Victoria and Albert Museum. ^ "FuturePlan – Victoria and Albert Museum". vam.ac.uk. 6 May 2011. Retrieved 12 May 2011. ^ "'Our Europe is an inclusive Europe': the Victoria and Albert Museum's new European Galleries". Apollo. 4 December 2015. ^ "FuturePlan Live: Europe 1600 – 1815". Victoria & Albert Museum. Archived from the original on 8 December 2015. ^ "V&A · The V&A East project". Victoria and Albert Museum. Retrieved 9 March 2019. ^ Physick 1982, p. 16. ^ a b c Sheppard 1975, p. 248. ^ Physick 1982, p. 19. ^ Physick 1982, p. 22. ^ Harry Francis Mallgrave, Gottfried Semper: Architect of the Nineteenth Century, 1996, p. 226. ^ Physick 1982, p. 30. ^ Physick 1982, p. 35. ^ Sheppard 1975, p. 97. ^ Sheppard 1975, p. 252. ^ Physick 1982, p. 252. ^ "No. 27081". The London Gazette. 19 May 1899. p. 3186. ^ "A Grand Design: The Art of the Victoria and Albert Museum". ArtMag.com. ^ "A Grand Design: A History of the Victoria and Albert Museum". Victoria and Albert Museum. This microsite has been adapted from the book A Grand Design: The Art of the Victoria and Albert Museum, which was published to support the exhibition of the same name. To reflect the structure of the book the site is divided into essays, listed in the navigation to the left of the screen. Each essay contains the relevant illustrations and is followed by the images of objects and their catalogue entries from the book. Footnotes follow at the end of each essay. Authors of essays and catalogue entries are credited with each piece. ^ Physick 1982, p. 246. ^ Sheppard 1975, p. 254. ^ Physick 1982, p. 269. ^ a b Physick 1982, p. 270. ^ "Designing Britain – BCMI Introduction". Vads.ahds.ac.uk. 20 December 2002. Archived from the original on 15 May 2011. Retrieved 12 May 2011. ^ a b Banham & Hillier 1976, p. 58. ^ "ARTS | V&A to have £150m facelift". BBC News. 18 April 2002. Retrieved 12 May 2011. ^ Lusiardi, Federica (27 April 2016). "The renovated V&A by Amanda Levete Architects". inexhibit. Retrieved 19 March 2017. ^ "Kensington Palace on Twitter". Twitter. Retrieved 26 March 2018. ^ "Board of Trustees VABT (09)48 Minutes". vam.ac.uk. ^ "The V&A AT DUNDEE - MAKING IT HAPPEN - FAQ". vandaatdundee.com. ^ Moore, Rowan (15 September 2018). "V&A Dundee review – a flawed treasure house on the Tay". The Guardian. Retrieved 16 September 2018. ^ Klettner, Andrea (29 January 2010). "New contest revives V&A extension hopes". Architectsjournal.co.uk. Retrieved 12 May 2011. ^ "Board of Trustees. Minutes. 23 March 2007". vam.ac.uk. ^ "Building V&A Dundee". www.stromafilms.co.uk. ^ a b Martin Bailey (15 August 2013), V&A Dundee gets planning green light Archived 21 August 2013 at the Wayback Machine The Art Newspaper. ^ "V&A Dundee Museum of Design announces opening date". BBC News. 18 January 2018. Retrieved 18 January 2018. ^ Martin Wainwright (22 December 2008). "Blackpool hopes V&A might like to be beside the seaside". The Guardian. London. Retrieved 12 May 2011. ^ a b "Blackpool Museum would have cost £60m". Blackpool Gazette. 3 December 2008. Retrieved 12 May 2011. ^ Hogg, Gill; Liao, Min-Hsiu; O'Gorman, Kevin (2014). "Reading between the lines: Multidimensional translation in tourism consumption". Tourism Management. 42: 157–164. doi:10.1016/j.tourman.2013.10.005. ^ "V&A · Admission to the V&A is free". Victoria and Albert Museum. Retrieved 9 March 2019. ^ Physick 1982, p. 23. ^ Physick 1982, p. 33. ^ "Victoria and Albert Museum: Quadrangle". Royal Institute of British Architects. Archived from the original on 7 April 2012. Retrieved 16 December 2010. ^ Physick 1982, p. 39. ^ Physick 1982, p. 47. ^ Physick 1982, p. 53. ^ Physick 1982, p. 92. ^ Physick 1982, p. 62. ^ Physick 1982, p. 71. ^ Carol A. Hrvol Flores, Owen Jones: Design, Ornament, Architecture and Theory in an Age in Transition, 2006, p. 94. ^ Physick 1982, p. 124. ^ Physick 1982, p. 120. ^ Physick 1982, p. 118. ^ Physick 1982, p. 131. ^ Physick 1982, p. 133. ^ Physick 1982, p. 135. ^ Physick 1982, p. 139. ^ Bridget Cherry & Nikolaus Pevsner, The Buildings of England London 3: North West, 1991, p. 496. ^ Physick 1982, p. 146. ^ Physick 1982, p. 148. ^ "Sackler Centre for arts education at the V&A". Victoria and Albert Museum. Archived from the original on 16 May 2010. Retrieved 16 December 2010. ^ Physick 1982, p. 151. ^ Physick 1982, p. 155. ^ Physick 1982, p. 156. ^ Physick 1982, p. 172. ^ a b Physick 1982, p. 174. ^ Physick 1982, p. 175. ^ "Victoria and Albert Museum: Competition to complete the museum". Royal Institute of British Architects. Archived from the original on 8 September 2012. Retrieved 16 December 2010. ^ A. Stuart Gray, Edwardian Architecture: A Biographical Dictionary, 2nd edition, 1988, p. 374. ^ Physick 1982, p. 228. ^ Bridget Cherry & Nikolaus Pevsner, The Buildings of England London 3: The North West, 1991, p. 495. ^ Physick 1982, p. 274. ^ Physick 1982, p. 273. ^ Physick 1982, p. 276. ^ a b Physick 1982, p. 277. ^ "Completed Projects – Victoria and Albert Museum". vam.ac.uk. 5 May 2011. Archived from the original on 9 October 2011. Retrieved 12 May 2011. ^ "Elsewhere: London: The Millennium Projects: Museum Expansions". www.thecityreview.com. ^ "AL_A win V&A Exhibition Road project - Dezeen". dezeen.com. 28 March 2011. ^ "V&A museum Exhibition Road extension by AL_A - Dezeen". dezeen.com. 11 July 2012. ^ Victoria and Albert Museum, Online Museum (30 September 2011). "Word & Image". www.vam.ac.uk. Retrieved 9 March 2019. ^ V&A Collecting Plan Including Acquisition & Disposal Policy, August 2004. ^ "About the V&A and RIBA Architecture Partnership Collections – Victoria and Albert Museum". vam.ac.uk. 6 May 2011. Archived from the original on 28 May 2010. Retrieved 12 May 2011. ^ Douglas Lewis, The Drawings of Andrea Palladio, 2nd edition, 2000. ^ Rosalys Coope, Catalogue of the Drawings Collection of the RIBA: Jacques Gentilhatre, 1972. ^ John McAndrew, Catalogue of the Drawings Collection of the RIBA: Antonio Visentini, 1974. ^ John Harris & Gordon Higgott, Inigo Jones Complete Architectural Drawings, 1989. ^ Alister Rowan, Catalogues of Architectural Drawings in the V&A: Robert Adam, 1988. ^ Michael Snodin (ed. ), Catalogues of Architectural Drawings in the V&A: Sir William Chambers, 1996. ^ Pierre de la Ruffuniere du Prey, Catalogues of Architectural Drawings in the V&A: Sir John Soane, 1985. ^ Alexandra Wedgwood, Catalogues of Architectural Drawings in the V&A: A. W. N. Pugin and the Pugin Family, 1985. ^ "109. Window from Sir Paul Pindar's House, Bishopsgate. [image 400x556 pixels]". Fromoldbooks.org. Retrieved 12 May 2011. ^ "Image – V&A". vam.ac.uk. Retrieved 12 May 2011. ^ a b "About the Collection – Victoria and Albert Museum". vam.ac.uk. 8 March 2004. Archived from the original on 21 March 2009. Retrieved 21 August 2011. ^ "Image – V&A". vam.ac.uk. 14 August 2011. Archived from the original on 1 August 2011. Retrieved 21 August 2011. ^ a b "150 Facts about the V&A for the 150th Anniversary – Victoria and Albert Museum". vam.ac.uk. 14 August 2011. Archived from the original on 29 July 2011. Retrieved 21 August 2011. ^ "The Mazarin Chest Project – Victoria and Albert Museum". vam.ac.uk. Archived from the original on 29 April 2008. Retrieved 21 August 2011. ^ "Book Collections – Victoria and Albert Museum". vam.ac.uk. 21 October 2010. Archived from the original on 6 May 2010. Retrieved 21 August 2011. ^ "Stock photo and image search by V&A Images". VandAimages.com. Retrieved 21 August 2011. ^ "Forster Collection – Victoria and Albert Museum". vam.ac.uk. 14 August 2011. Retrieved 21 August 2011. ^ "Dyce Collection – Victoria and Albert Museum". vam.ac.uk. 14 August 2011. Retrieved 21 August 2011. ^ "Beatrix Potter Collections – Victoria and Albert Museum". vam.ac.uk. Archived from the original on 11 August 2011. Retrieved 21 August 2011. ^ Rowan Watson, Illuminated Manuscripts and Their Makers, 2003. ^ a b Dodds, D.; Ravilious, E. (2009). "The Factory Project: digitisation at the Victoria and Albert Museum". Art Libraries Journal. 34 (2): 10–16. ^ Victoria and Albert Museum; Online Museum; Web Team. "Comics in the National Art Library". www.vam.ac.uk. Retrieved 19 October 2015. ^ Desmond Fitz-Gerald, The Norfolk House Music Room, 1973. ^ "Bashaw – Victoria and Albert Museum". vam.ac.uk. 21 April 2011. Retrieved 21 August 2011. ^ Susan Weber Soros (ed. ), E. W. Godwin: Aesthetic Movement Architect and Designer, 1999. ^ Michael Snodin & John Styles, Design & the Decorative Arts: Britain 1500–1900, 2001. ^ Martin Mortimer, The English Glass Chandelier, 2000. ^ "Stained Glass – Victoria and Albert Museum". vam.ac.uk. Archived from the original on 23 December 2012. Retrieved 21 August 2011. ^ David irwin, John Flaxman 1755–1826: Sculptor, Illustrator, Designer, 1979. ^ Evening dress worn by Audrey Hepburn in the collection of the V&A accessed 28 January 2010. ^ "Fashion in Motion". vam.ac.uk. The Victoria and Albert Museum. 2016. Retrieved 16 February 2017. ^ "1960s Fashion Designers – Victoria and Albert Museum". vam.ac.uk. 21 October 2010. Retrieved 21 August 2011. ^ Frances Hartog (Autumn 2008). "Costume cleaning conundrums". vam.ac.uk. Retrieved 16 March 2012. ^ "V&A · Shoes". Victoria and Albert Museum. ^ a b c Wainwright, Oliver (27 November 2012). "Pull up a chair: inside the V&A's brilliant new furniture gallery". The Guardian. Retrieved 14 December 2012. ^ Stockley, Philippa (29 November 2012). "The V&A's new furniture gallery". Homes and Property: The Evening Standard. Archived from the original on 17 January 2013. Retrieved 14 December 2012. ^ "London Museums". London School of Economics. Archived from the original on 20 February 2011. Retrieved 14 December 2012. ^ "Leg from a stool or chair". V&A Collections Online. Retrieved 14 December 2012. ^ "Image – V&A". vam.ac.uk. Archived from the original on 12 August 2011. Retrieved 21 August 2011. ^ Christopher Wilk, Frank Lloyd Wright: The Kaufmann Office, 1993. ^ "Tiaras – V&A Exhibition". vam.ac.uk. Retrieved 21 August 2011. ^ "Apollo: The Victoria and Albert Museum, London, has started work on a new jewellery gallery, that is planned to open in 2008". 27 December 2005. Archived from the original on 27 December 2005. ^ Nina Siegal (10 May 2008). "Jewel in Its Crown". ARTINFO. Retrieved 14 May 2008. ^ "British Silver Pre-1800, Room 65 – Victoria and Albert Museum". vam.ac.uk. 14 August 2011. Archived from the original on 24 February 2009. Retrieved 21 August 2011. ^ "The Sacred Silver Collection – Victoria and Albert Museum". vam.ac.uk. 14 August 2011. Retrieved 21 August 2011. ^ "Paul de Lamerie Silver – Victoria and Albert Museum". vam.ac.uk. 14 August 2011. Retrieved 21 August 2011. ^ "The Hereford Screen – Victoria and Albert Museum". vam.ac.uk. Retrieved 21 August 2011. ^ "Gloucester candlestick". Britannica Online Encyclopedia. Archived from the original on 10 May 2007. Retrieved 21 August 2011. ^ "The Reichenau Crozier – Victoria and Albert Museum". vam.ac.uk. 14 August 2011. Archived from the original on 28 November 2009. Retrieved 21 August 2011. ^ a b Brown, Ismene (8 February 2010). "The V&A is Wrong Far from closing, the musical gallery should be a palace of sensory pleasures". The Arts Desk.com. Retrieved 14 December 2012. ^ "Musical instruments in the South and South East Asian collection". V&A. Retrieved 14 December 2012. ^ "Editorial: In praise of ... the V&A's instrument collection". The Guardian. 4 February 2010. Retrieved 14 December 2012. ^ Kottick, Edward L. (2003). A history of the harpsichord. Bloomington, Ind. : Indiana Univ. Press. p. 94. ISBN 0-253-34166-3. ^ "Grand piano designed by Edward Burne-Jones". V&A. Retrieved 14 December 2012. ^ Kopf, Silas (2008). A marquetry odyssey : historical objects and personal work (1st ed.). Manchester, Vt.: Hudson Hills Press. p. 163. ISBN 1-55595-287-9. ^ "Victoria and Albert Museum: House of Lords". Retrieved 14 December 2012. ^ a b "To ask Her Majesty's Government what representations they have received or made in relation to the future of the musical instrument collection at the Victoria and Albert Museum. [HL2199]". www.parliament.uk. Retrieved 14 December 2012. ^ Bradley Strauchen; Mimi Waitzman (18 March 2011). "The Art of Harmony: The V&A and Horniman Music Collections". Dulwich OnView. Retrieved 14 December 2012. ^ Duchen, Jessica. "Should Strads be played?". Retrieved 14 December 2012. ^ "Raphael Cartoons – Victoria and Albert Museum". vam.ac.uk. 21 October 2010. Retrieved 21 August 2011. ^ "Constable – Victoria and Albert Museum". vam.ac.uk. 14 August 2011. Archived from the original on 20 April 2009. Retrieved 21 August 2011. ^ "Constable's Studies for the Hay-Wain – Victoria and Albert Museum". vam.ac.uk. 14 August 2011. Archived from the original on 26 July 2009. Retrieved 21 August 2011. ^ Paul Williamson (ed. ), European Sculpture at the Victoria and Albert Museum, 1996. ^ "Rodin at the V&A – Victoria and Albert Museum". vam.ac.uk. Archived from the original on 6 November 2011. Retrieved 21 August 2011. ^ Margaret Whinney, Sculpture in Britain 1530–1830, 2nd edition, 1988. ^ "Image – V&A". vam.ac.uk. 14 August 2011. Retrieved 21 August 2011. ^ Linda Parry (ed. ), William Morris, 1996, pp. 234–95. ^ a b "The Oxburgh Hangings". ^ "Study Rooms – Victoria and Albert Museum". vam.ac.uk. Archived from the original on 28 May 2010. Retrieved 12 May 2011. ^ About V&A Publishing. V&A. Retrieved 4 May 2015. ^ "Family activities in the Museum: Backpacks — Victoria and Albert Museum". vam.ac.uk. 6 May 2011. Archived from the original on 20 April 2010. Retrieved 12 May 2011. ^ "Research – Victoria and Albert Museum". vam.ac.uk. 5 May 2011. Archived from the original on 28 May 2010. Retrieved 12 May 2011. ^ "Research Reports – Victoria and Albert Museum". vam.ac.uk. 6 May 2011. Archived from the original on 28 May 2010. Retrieved 12 May 2011. ^ "Conservation – Victoria and Albert Museum". vam.ac.uk. 6 May 2011. Archived from the original on 30 March 2010. Retrieved 12 May 2011. ^ "2015's most popular exhibitions by genre and city". theartnewspaper.com. Archived from the original on 5 April 2016. Retrieved 5 April 2016. Banham, Mary; Hillier, Bevis, eds. (1976). A Tonic to the Nation: The Festival of Britain 1951. Physick, John (1982). The Victoria and Albert Museum: The History of Its Building. ISBN 978-0-7148-8001-3. OCLC 230893308. Sheppard, F.H.W., ed. (1975). Survey of London XXXVIII: The Museums Area of South Kensington and Westminster.